Major General Robert N. Ginsburgh was deputy director of the Joint Staff, Organization of the Joint Chiefs of Staff, Washington, D.C.
General Ginsburgh was born at Fort Sill, Oklahoma, in 1923. He graduated from Phillips Academy, Andover, Massachusetts, in 1940. After a year at Harvard University, he entered the U.S. Military Academy at West Point, New York, from which he graduated in 1944 with a bachelor of science degree and a commission as second lieutenant. After completing the Field Artillery Officer Basic Course, he was assigned as a battery officer in field artillery units of the 89th and 2d Infantry divisions from October 1944 to June 1945 in the European Theater of Operations. He was then transferred to Japan where he served as a staff officer in Army Service Command Coronet and General Headquarters, Supreme Commander of Allied Powers, Japan. In July 1946 General Ginsburgh accepted a fellowship at the Littauer Center (now part of the John F. Kennedy School) at Harvard University. He received a master of public administration degree in 1947, a master of arts degree in 1948 and a doctorate in 1949 from that university. He returned to the U.S. Military Academy in August 1948 to serve as assistant professor of social sciences. In 1949 he transferred to the Air Force and on completion of his tour of duty at West Point in June 1951 was assigned to the Legislation and Liaison Directorate of the Office of the Secretary of the Air Force in Washington, D.C. He graduated from the Air Command and Staff School at Maxwell Air Force Base, Alabama, in 1953. In May 1955 he went to Naples, Italy, where he served as plans officer at Headquarters Allied Air Forces Southern Europe until April 1958. He then was stationed briefly as a programming officer at the Air Proving Ground Center at Eglin Air Force Base, Florida, prior to returning to Washington, D.C., to become deputy director of the Office of Public Services, Office of the Assistant Secretary of Defense (Public Affairs). His responsibilities included the direction of the Joint Civilian Orientation Conference. He was appointed assistant executive to the Air Force chief of staff in July 1959 and held that position under generals White and LeMay until August 1962 when he was selected to attend the National War College. Upon graduation, he served for a year as Air Force research fellow on the Council on Foreign Relations in New York City. In June 1964 he was appointed a member of the Policy Planning Council in the Department of State, serving in that position for two years. He assumed duties in July 1966 as Air Force member, Chairman's Staff Group in the Office of the Chairman of the Joint Chiefs of Staff. In that capacity, he served also as a senior staff member, National Security Council Staff, and in June 1968 was the Armed Forces aide to the president of the United States, in addition to his other duties. General Ginsburgh was reassigned to Maxwell Air Force Base in February 1969, where he served as commander of the Aerospace Studies Institute. In July 1971 General Ginsburgh returned to Headquarters U.S. Air Force, Washington, D.C., to serve as chief, Office of Air Force History, a separate staff office under the Chief of Staff. In April 1972 he was appointed director of information in the Office of the Secretary of the Air Force. He became deputy director, the Joint Staff, Organization of the Joint Chiefs of Staff, in June 1974. His published writings include: U.S. Military Strategy in the Sixties, 1965; U.S. Military Strategy in the Seventies, 1970 (editor); U.S. Military Strategy and the Nixon Doctrine, 1971 (editor); Economics of National Security, 1960 (contributor); Principles of Insurance (editor), 1949-1950; articles in Foreign Affairs, U.S. News and World Report, Institute of Naval Proceedings, Strategic Review, Military Review, Air Force Magazine, Air University Review and Assembly. His military decorations and awards include the Distinguished Service Medal, Silver Star, Legion of Merit with oak leaf cluster, Joint Service Commendation Medal, Army Commendation Medal, and Purple Heart. He was promoted to the grade of Major General effective April 1, 1971, with date of rank Jan. 1, 1967. 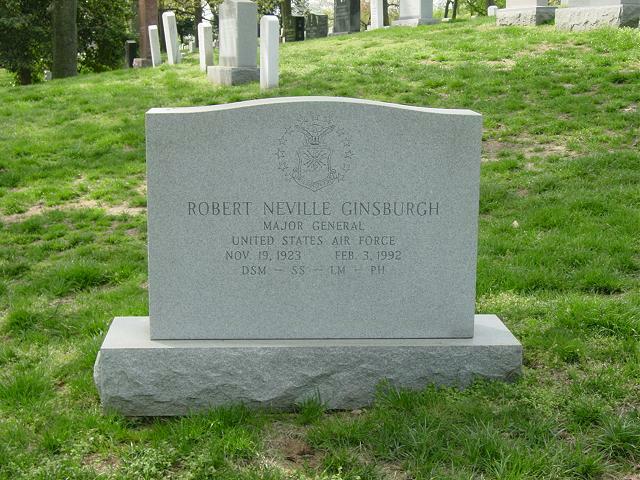 General Gingsburgh was buried with full military honors in Section 30, Grave 118, Arlington National Cemetery.